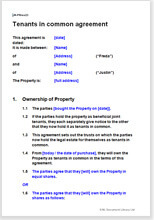 This document protects the individual interest of each owner. It does not cover property management. Depending on your relationship, you may also want to consider a prenuptial agreement or a separation agreement to set out ownership of other assets.